Aflatoxins (AFs) and fumonisins (FUMs) are mycotoxins produced by Aspergillus flavus and Fusarium verticillioides, respectively, that commonly contaminate corn in the southeastern United States. These mycotoxins pose significant health risks to both humans and animals, and are therefore regulated by the U.S. Food and Drug Administration (FDA). A variety of pre- and post-harvest management practices are being explored to reduce mycotoxin contamination in corn; more information on these practices can be found at Corntoxins.org and Corn Mycotoxins. Aspergillus flavus causes ear rot of maize and contaminates corn and other oilseed crops with AFs. AFs were discovered as the causal agent of an outbreak of Turkey X disease in London in 1960 (Blount 1961). They are among the most potent naturally occurring carcinogens known and have been labeled as Group I carcinogens by the International Agency for Research on Cancer (IARC 1987). They have been implicated in the acute aflatoxicosis outbreaks in Kenya in 2004 and 2005 that caused more than 150 deaths (Strosnider et al. 2006). Due to the adverse health impacts that AFs pose to humans and animals, FDA regulations require grains to have AF levels lower than 20 parts per billion (ppb) for human consumption (FDA 2009). The consumption of AF-contaminated grain by livestock can lead to decreased weight, hemorrhaging, and immunocompromised animals (CAST 2003). FDA regulations require grains to have AF levels lower than 100ppb for animal feed (FDA 2009). FUMs were described in 1988 after research with F. verticillioides showed that the fungus produced mycotoxins that posed health risks to horses, pigs, and rats (Gelderblom et al. 1988). FUMs cause equine leucoencephalomalacia (ELEM) in horses and pulmonary edema in pigs (Kriek et al. 1981). They are associated with an increased risk of esophageal cancer and neural tube defects in humans who consume large amounts of mycotoxin-contaminated grain (Sydenham et al. 1990). In 2001, the FDA recommended FUM levels of no more than 4 parts per million (ppm) for human consumption (FDA 2001). More information on guidance levels of mycotoxins in livestock feed can be found at the National Corn Growers Association website. Because of the health and economic consequences of mycotoxin contamination, we examined the efficacy of three management practices: the use of fungicides, biocontrol agents, and Bt hybrids, for reducing mycotoxin contamination in corn. In previous tests, the fungicides Headline, Quilt Xcel, and Stratego YLD were identified as being effective in controlling mycotoxin contamination (Meyers et al. 2015). Therefore, we tested Stratego YLD for its ability to effectively reduce mycotoxin contamination in corn. While this fungicide is not specifically registered for reducing mycotoxins, it may provide protection from fungal invaders and indirectly reduce mycotoxin levels. Stratego YLD, a Bayer Crop Science fungicide, is used to control gray leaf spot, rusts, anthracnose, northern and southern corn leaf blight, and brown spot of corn (Bayer Crop Science 2014). The most effective practice for reducing AF levels in maize has been through the application of biological control agents. Two biocontrol strains, AF36 (=NRRL 18543) and Afla-Guard® (=NRRL 21882), have been registered with the Environmental Protection Agency (EPA) for use on corn. Both are naturally-occurring strains of A. flavus that do not produce AFs. When applied to growing corn, the biocontrol strains outcompete native toxigenic A. flavus, thereby reducing AF contamination (Cotty et al. 2007). In this study, we examined how applying biocontrol agents at two different growth stages and at three different application rates impacted the efficacies of the biocontrols to reduce mycotoxin contamination in maize. One of the most common genetic modifications made to commercial corn is the incorporation of genes from Bacillus thuringiensis, a bacterium that expresses proteins that are toxic to insects. Current Bt hybrids are effective in controlling corn borers (Ostrinia nubilalis) (Siebert et al. 2012) and corn earworm (Helicoverpa zea) (Buntin et al. 2004; Storer et al. 2001). Bt hybrids can also lessen mycotoxin contamination by reducing insect damage to the stalk and silk (Meyers et al 2015). We examined the efficacy of two common Bt hybrid corn lines, Yield Guard and Viptera, and one non Bt (Syngenta N78S-GT) for reducing FUM and AF levels. 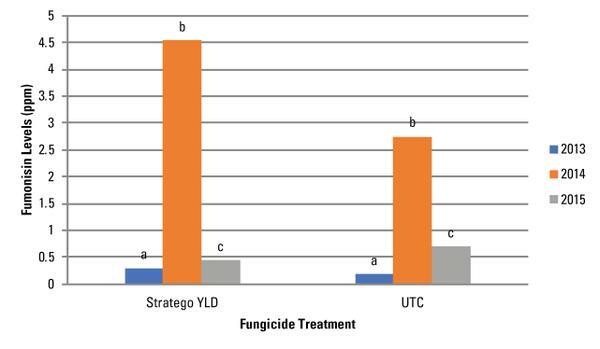 Stratego YLD, a triazole fungicide with two modes of action, was applied to corn at R1, when silks are visible outside of husks, at the recommended rate of 4 to 5 oz/acre. AF and FUM levels were measured and compared to untreated check plots to observe the efficacy of fungicides to reduce mycotoxins. Did fungicides reduce mycotoxin contamination? 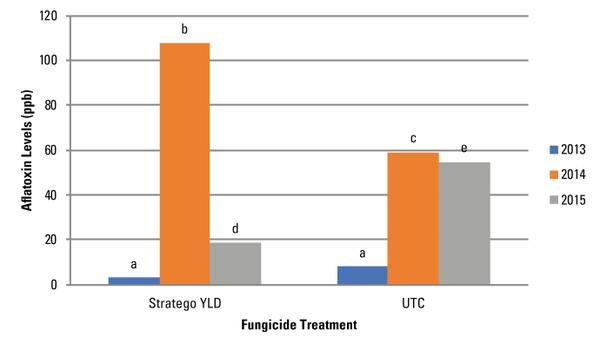 Over three years, Stratego YLD was compared with an untreated check (UTC) for efficacy in reducing mycotoxin contamination in corn (Figure 1 and Figure 2). Results varied depending on the season. In 2013, a year with low contamination, no differences were found. In 2014, the use of a fungicide resulted in an increase in AFs, while in 2015 Stratego YLD decreased mycotoxin contamination. These results indicate that factors other than fungicide are influencing AF contamination. Based on these tests there is no reliable evidence that a fungicide can reduce AF contamination. Did the use of a fungicide increase yield? Yield results also varied by season (Figure 3). 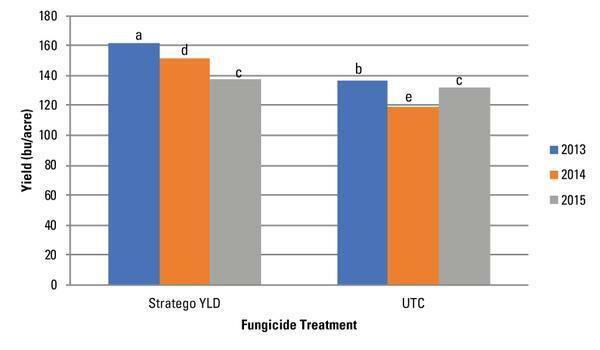 In 2013, the use of Stratego YLD increased yield by 21 bu/acre, whereas in 2015 the use of Stratego YLD did not increase yield. These results are similar to those obtained in other studies (Fawcett et al. 2014) examining the impact of fungicides on corn, which show that results are highly variable and depend on the environment and other factors such as the level of disease in corn. Due to inconsistencies in fungicide studies to reduce mycotoxins, there are currently no recommended applications of fungicides to reduce AFs and FUMs (CIMMYT, 2008). Figure 1. Average AF contamination for Stratego YLD and an untreated check (UTC) over three years. Different letters within the same year denote significance at P < 0.05. Figure 2. Average FUM contamination for Stratego YLD and an untreated check (UTC) over three years. Different letters within the same year denote significance at P < 0.05. Figure 3. Average yield for Stratego YLD and an untreated check (UTC) over three years. Different letters within the same year denote significance at P < 0.05. 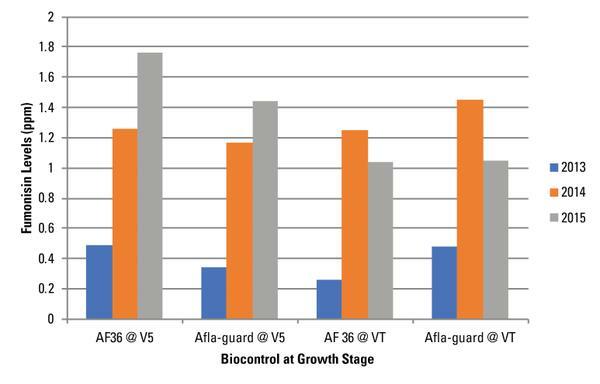 Afla-Guard® and AF36 were applied at two different stages of corn growth: V5, where corn has five fully developed leaves; and VT, where 50% of the tassel has emerged, at rates of 5, 7.5, or 10 pounds per acre (lb/acre). FUM and AF contamination and yield were measured to analyze performance of applied biocontrols. Yield and mycotoxin levels also were taken for non-treated plots that served as controls. Did biocontrol agents reduce mycotoxin contamination? Over the three-year period, AF and FUM contamination were lower in plots where the biocontrol agents Afla-Guard® and AF36 were applied. There was minimal difference in the amount of control that either biocontrol agent provided for FUM. Plots treated with AF36 had slightly lower levels of AF contamination than Afla-Guard® treated plots. Due to low levels of FUM contamination (< 0.2 ppm), it was not possible to fully evaluate differences between the biocontrol products applied in reducing FUM contamination. 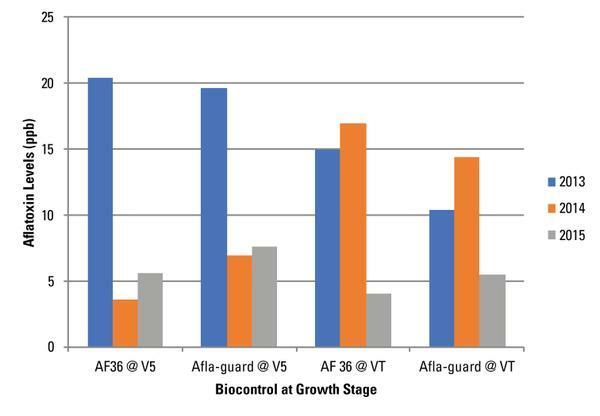 Plots treated with AF36 had slightly higher yields compared to Afla-Guard® treated plots when applied at either V5 or VT. Application timing did not affect the efficacy of either AF36 or Afla-Guard® in reducing either AF (Figure 4) or FUM (Figure 5) contamination. Despite differences in mycotoxin contamination within and across years, there were no significant differences due to timing of application. 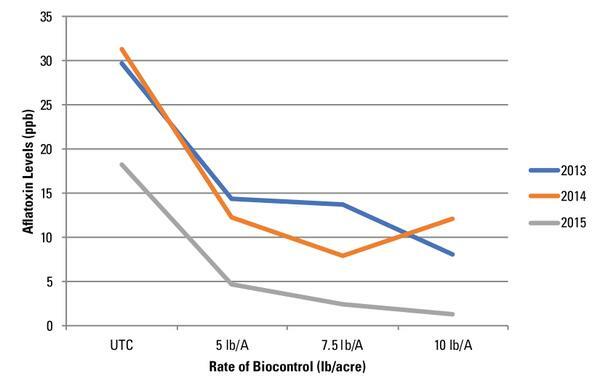 Overall, application timing of either biocontrol had little effect on yield. The rate at which either AF36 or Afla-Guard® was applied impacted AF contamination in each of the three years. In every year, the untreated check had significantly higher AF contamination than any of the application rates (Figure 6). As expected there were no significant differences in FUM contamination across application rates and the untreated control. Likewise, there was no difference in yield across application rates or the untreated control. The more biocontrol formulation that was applied to the field, the less AF contamination was present. The recommended rate of application for both biocontrol agents is 10 lb/acre. The costs of material and application vary for the biocontrol products: the cost of AF36 plus the cost of application is $6 to $15 per acre, and the cost of Afla-Guard® and its application is $16 to $30 per acre (Wu et al. 2008). The most important consideration when using a biocontrol product is the application rate. When applied at 7.5 or 10 lb/acre, both biocontrol products were effective in reducing AF contamination while maintaining yield. Applications at V5 were as effective as those at VT, which provides growers a wide window of opportunity to apply these products. Neither product had a significant impact on FUM contamination; however, the level of FUM contamination in the field was low. Further work is needed to address whether applying biocontrol agents has an impact on FUM contamination when levels are high. Three Syngenta hybrids, N74R-3000GT (Yield Guard), N78S-3111 (Viptera), and N78S-GT (non-Bt), were tested for performance and benefits against mycotoxin contamination in 2013 and 2014. There were significant differences in AF contamination in 2013. 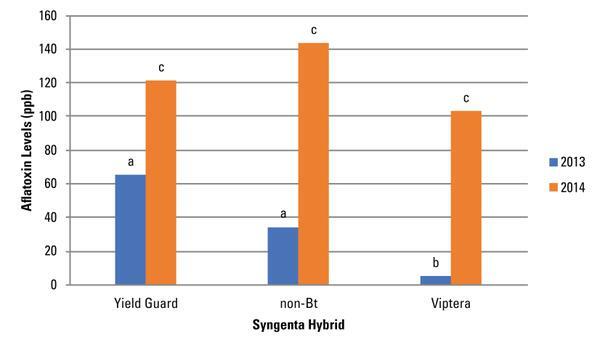 Syngenta N74R (Yield Guard) provided the least amount of control against mycotoxin contamination (65 ppb); Syngenta N78S-3111 (Viptera) provided the best control against AFs (5 ppb); and Syngenta N78S-GT (non Bt) provided moderate control (34 ppb) (Figure 7). In 2014, no significant differences were found for any of the hybrids. It was difficult to detect FUM contamination differences amongst hybrids due to the very low levels of FUM observed in 2013 (Figure 8). In 2014, however, the Viptera hybrid had significantly less FUM than the non-Bt hybrid. Although there was no significant difference among the hybrids, N78S-3111 (Viptera) still had the lowest FUM contamination at 0.76 ppm compared with N74R-3000GT, which had 1.2 ppm. There were no significant yield differences amongst hybrids in either 2013 or 2014 (Figure 9). N74R-3000GT (Yield Guard) yielded the same as N78S-3111 (Viptera) at 193 bu/acre. The lowest yield at 191 bu/acre was N78S-GT (non-Bt). Yield levels were lower in 2014 compared to 2013. The Viptera hybrid (N78S-3111) reduced AF and FUM contamination while maintaining yield. Therefore, this study suggests that corn producers could use Viptera hybrids for the reduction of mycotoxins while obtaining normal yields. Figure 4. AF concentrations in response to timing of biocontrol application. Figure 5. FUM concentrations in response to timing of biocontrol application. Figure 6. AF concentrations (ppb) in response to biocontrol application rate (lb/acre). In each of the three years, the zero-application rate was significantly higher (P < 0.05) than the other three rates. Figure 7. Average AF contamination for Syngenta N74R-3000GT (Yield Guard), N78S-GT (non-Bt), and N78S-3111 (Viptera) corn hybrids over two years. Different letters within the same year denote significance at P < 0.05. Figure 8. 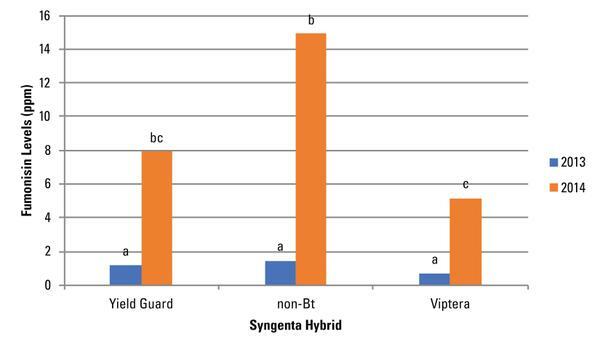 Average FUM contamination for Syngenta N74R-3000GT (Yield Guard), N78S-GT (non-Bt), and N78S-3111 (Viptera) corn hybrids over two years. Different letters within the same year denote significance at P < 0.05. Figure 9. 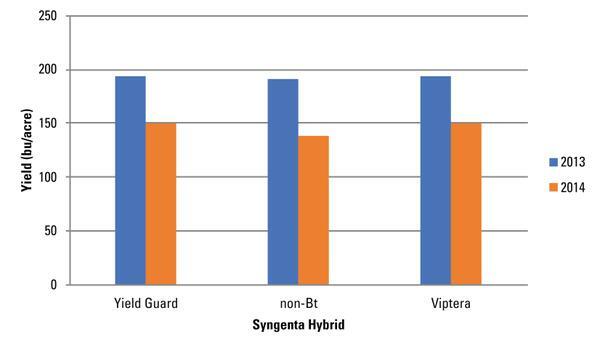 Average yield for Syngenta N74R-3000GT (Yield Guard), N78S-GT (non-Bt), and N78S-3111 (Viptera) corn hybrids over two years. No significant differences were noted among the hybrids. The results from our study show that the use of a Bt hybrid, specifically Viptera, and either biological control product application are the best ways to reduce mycotoxin contamination in a cornfield. Fungicides do not provide control for mycotoxins. Timing of biocontrol application played little role in how effective either AF36 or Afla-Guard® was at reducing AF or FUM contamination. In general, the higher the rate of biocontrol application, the better control of mycotoxins; however, there was no significant difference in the efficacy of the control of mycotoxins or grain yield when the biocontrols were applied at 7.5 lb/acre and 10 lb/acre. The recommended application rate for AF36 and Afla-Guard® is 10 lb/acre, so this reduction in rate of biocontrol would make applying the biocontrols more cost effective for the grower. The Bt hybrid Viptera (N78S-3111) provided control of AF in 2013 and had the greatest reduction of FUM levels over the two-year period. A recommended effective control program for AF and FUM in corn includes the use of Viptera (N78S-3111) and the application of either AF36 or Afla-Guard® at rates of 7.5 lb/acre. Bayer CropScience. 2014. Stratego YLD Overview. Accessed 13 June 2018. Blount WP. 1961. Turkey “X” disease. J Br Turkey Fed. 9, 55-58. Buntin GD, K.L. F, Lynch RE. 2004. Assessment of experimental Bt events against fall armyworm and corn earworm in field corn. Journal of Economic Entomology 97, 259-264. Cotty PJ, Antilla L, Wakelyn PJ. 2007. Competitive exclusion of aflatoxin producers: Farmer-driven research and development. In: Biological control: a global perspective (eds. Vincent C, Goettel MS, Lazarovits). CAB International. Gelderblom WC, Jaskiewicz K, Marasas WF, et al. 1988. Fumonisins--novel mycotoxins with cancer-promoting activity produced by Fusarium moniliforme. Applied and Environmental Microbiology 54, 1806-1811. Kriek NP, Kellerman TS, Marasas WF. 1981. A comparative study of the toxicity of Fusarium verticillioides (= F. moniliforme) to horses, primates, pigs, sheeps, and rats. Onderstepoort Journal of Veterinary Research 48, 129-131. Siebert MW, Nolting SP, Hendrix W, et al. 2012. Evalulation of corn hybrids expressing Cry1F, cry1A.105, Cry2Ab2, Cry34Ab1/Cry35Ab1, and Cry3Bb1 against southern United States insect pests. Journal of Economic Entomology 105, 1825-1834. Storer NP, Van Duyn JW, Kennedy GG. 2001. Life History Traits of Helicoverpa zea (Lepidoptera: Noctuidae) on Non-Bt and Bt Transgenic Corn Hybrids in Eastern North Carolina. Journal of Economic Entomology 94, 1268-1279. Strosnider H, Azziz-Baumgartner E, Banziger M, et al. 2006. Workgroup Report: Public Health Strategies for Reducing Aflatoxin Exposure in Developing Countries. Environmental Health Perspectives 114, 1898-1903. Sydenham EW, Thiel PG, Marasas WFO, et al. 1990. Natural occurrence of some Fusarium mycotoxins in corn from low and high esophageal cancer prevalence areas of the Transkei, Southern Africa. Journal of Agricultural and Food Chemistry 38, 1900-1903. Van Duyn, J. W. 2008. Transgenic Bt Corn, A Powerful Pest Management Tool. NC State Extension. Wu F, Liu Y, Bhatnagar D. 2008. Cost-effectiveness of aflatoxin control methods: economic incentives. Toxin Reviews 27, 203-225. Yin Y, Yan L, Jiang J, Ma Z. 2008. Biological control of aflatoxin contamination in crops. Journal of Zhejiang University. Science. B 9, 787-792.